Few people are as thoroughly engulfed in the mishmash of online-only services collectively dubbed "the cloud" as I am. Being a modern, always-mobile technology writer, I've arranged my workflow to be completely independent of my physical location. I need the ability to plop down in front of any computer in the world, and suffer from minimal disruption. Now that the disclaimers are out of the way, let's turn to the nasty. Several incidents during the past week drove home a bleak realization: Yes, the cloud is flexible and powerful and paradigm-shattering—but you just can't rely on it completely. The headaches started last Friday when Microsoft's Windows Azure cloud service melted down for an extended period. That didn't bother me, personally—I'm not a business looking to "quickly build, deploy and manage applications across a global network of Microsoft-managed datacenters." 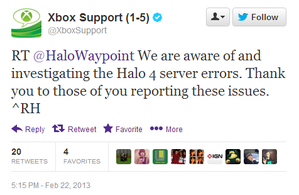 Nonetheless, the outage soon spread to consumer-facing applications. Multiple Xbox features went down for the count: Cloud-stored game saves, Xbox SmartGlass, and even Halo 4's online functionality were disrupted for several hours. If you were hoping to fill your entertainment void with an impromptu movie, you were also out of luck: Microsoft's Xbox Movie and Music services crapped out, too. 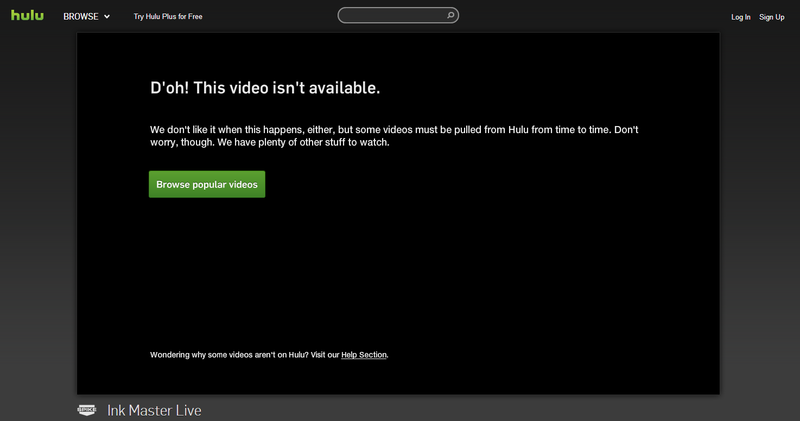 And several users reported running into problems with Netflix the same day, though the problems weren't widespread. Microsoft wasn't the only source of my cloud consternation during the past week. After stumbling across Spike TV's Ink Master on Hulu Plus, I binged on the first season in just three days, and was eager to jump into the second season the next evening—only to find that the show had been scrubbed from Hulu's servers. Grrr. Gmail wasn't the only Google service with quirks this week. Then, earlier this week, an enterprising TechHive editor was attempting to access his Gmail account from Mobile World Congress in Barcelona, only to find himself stymied for a short period. It was a temporary hiccup, but as anyone who's ever been on Twitter in the midst of a Gmail, SkyDrive, or Amazon Web Services outage can tell you, unscheduled downtime from a major cloud service provider can create a lot of grief for a lot of people. Finally, to top it all off, Zendesk—a popular cloud-based support services provider—was hacked, leaking the email addresses and occasionally the phone numbers of Twitter, Tumblr, and Pinterest users. So even when the cloud was working this week, it wasn't keeping our data safe, and this wasn't the first time it happened. Despite appearances so far, the point of this article isn't to drive you away from the cloud. The sky is not falling, and despite the aforementioned headaches, Web-based services tend to be exceptionally reliable and secure. Nope, I'm not scared of the cloud. I'm a child of the Internet age, and I veritably bask in its ever-connected possibilities. Too many other people, however, dive into the cloud whole-hog, with nary a thought spent on its downsides, and this exposes them to inconvenience and outright disaster. A little forethought can go a long way toward insulating your data from the cloud's surprise storms. Simply put, anything you have worth worrying about shouldn't be left alone on someone else's servers, no matter whether it's email, simple files, or even music and movies. The old "back up your data!" tenet holds doubly true even when you're dabbling in the cloud. Indeed, if you have control over your files, a service outage will leave you frustrated, but not crippled. 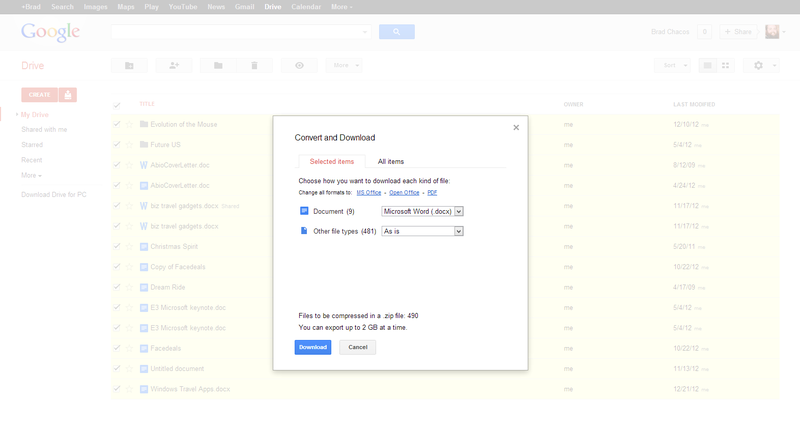 Saving your Google Docs to your computer is easy-peasy. Once your data is copied to your PC, you're also safe from the other perils of the cloud, including the threat of lost data or the dreaded platform "lock-in." In fact, I chose all my cloud services based on the central principle of data redundancy. To wit: SkyDrive's desktop app saves local copies of your files directly on your computer. (Dropbox, Google Drive, SugarSync, and most other cloud synchronization services do the same.) Pixlr lets you save your edited images in an online locker or straight to your computer, while Evernote has a handy-dandy export option, as does Microsoft's OneNote. HipChat was foisted upon me by my PCWorld bosses, but I use Digsby for all my other instant messaging services, and Digsby allows me to save transcripts of my conversations directly to my computer. 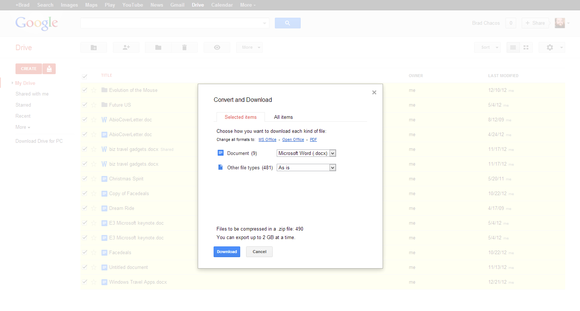 Google makes things a bit trickier, as Google Docs save in a weird application-specific format. Nonetheless, if you want to back up your files in one big .zip, select all the files and folders on your Drive homepage, then click More > Download. From there, you can choose the format you'd like your files exported in. Google Calendar has a straightforward export option. To save your Gmail messages, simply download them using an email client like Outlook or Thunderbird. Nice and easy. Most data- or file-focused cloud services offer similar ways to export your information, so you don't have to use the same services I do. Once all your valuable information is safely stored away on your hard drive, you can do whatever you want with it, regardless of whether the cloud service from which it originated is functional. Just be sure to save all that data to another storage device as part of your regular backup plan. (You do have a regular backup plan, don't you?) Also, don't forget to periodically download your cloud-stored data from services that lack automatic local saving options. Oh, and while we're at it, you should really be encrypting any truly sensitive data you store in the cloud. Plex not only streams media, it serves as an attractive home theater–PC interface and provides descriptions and art for your movies (just like Netflix). Things get a bit trickier when you turn to the world of cloud-hosted streaming media. Services like Spotify and Netflix don't allow you to export your playlists or queues, essentially locking you into their platforms. While you can't do about this aside from writing an angry letter (which will likely be ignored), you can create a self-controlled streaming backup to help you weather the occasional service outage or compensate for an Ink Master-esque missing show. To start, you'll need to own some DRM-free, locally stored media of your own, either by purchasing it online or by ripping your physical music and movies to your hard drive. Once that's done, you'll want to install and configure the Plex Media Server software on your PC or server, pointing it toward your media treasure trove in the process. 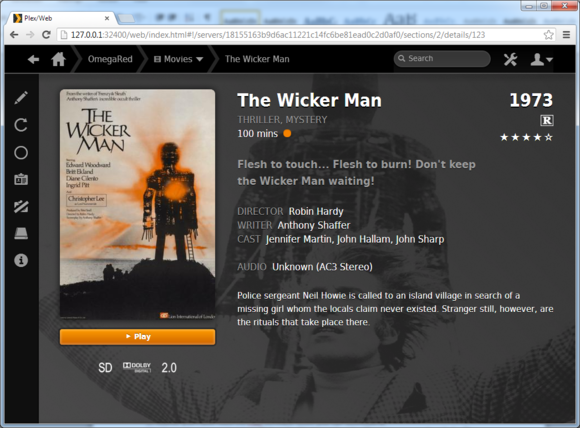 Plex is an awesome piece of software. After the Media Server is set up, it can stream your entertainment collection to other computers, most major mobile platforms, Samsung and LG smart TVs, Roku boxes, and yes, the Xbox 360 console. You can even stream in-browser or via a dedicated Windows 8 app, though that app—like the other mobile Plex clients—will set you back a few bucks. The Plex Media Server software transcodes outgoing media, ensuring it'll work without a hitch on receiving devices. I personally own, love, and recommend it. Is going to the trouble of setting up Plex just to safeguard against a Slacker or Hulu outage really worthwhile, when those outages usually shake themselves out within a few hours? Probably not. But Plex is a handy way to make sure your favorite songs and shows are available anywhere there's an Internet connection, even if they're not available on the major streaming services. Sure, the cloud works like a charm 99 percent of the time—but if you need a crucial cloud-stored file during that downcast 1 percent, these fail-safes can be proverbial lifesavers. And even if you're not worried by the idea of Gmail going down for a few hours, keeping a firm grasp on where your files are stored can protect you from accidental data loss or creeping platform lock-in. Given its upsides, you'd be crazy to let a few hiccups sour you on the cloud. But you'd be even crazier to rely on the cloud completely.